Two weeks ago, we presented you with some great low carb meaty soups. This week you wanted to follow up with some creamy vegetable options. Everyone loves potato soup in cold weather. The problem is that it can be loaded with carbs. One we saw on the internet sounded great but had 37 grams of carbs per serving! Not all potato soups are that high, but we wanted to present you with great alternatives that would taste amazing and make you feel like you’re indulging despite all of them having well under 20 grams of carbs. Unlike potato soup, which you might have to plan all of your other meals to accommodate, these are easy to fit into your healthy diet and might even make it so you can have dessert! We’re starting off with the highest carb and most autumnal soup on the list. Pumpkin season is here and the harvest can be seen everywhere. This recipe calls for canned pumpkin puree; you don’t have to deal with the hassle of making it yourself. 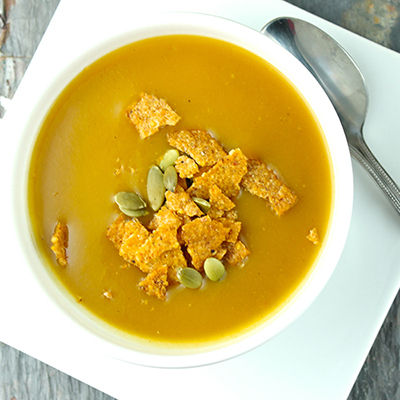 With 17 grams of carbs and 195 calories per half-cup serving, this soup is sure to get you into that fall feeling. Get the recipe. Cauliflower cheese is a favorite of many people. This version is low carb and low calorie. That’s a huge win on nights when it’s chilly and you just want to curl up with soup. 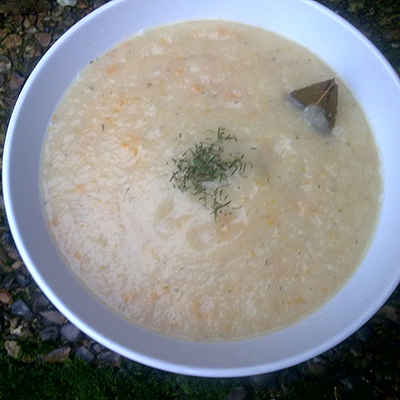 The soup has just over 100 calories and under five grams of carbohydrates in a half cup. With those numbers, this could become part of your regular winter rotation. If you want to lower the calories, you can substitute milk for the heavy cream. Get the recipe. 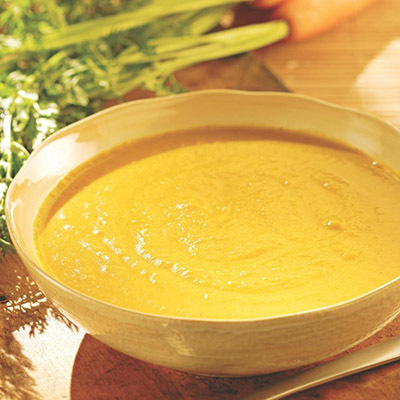 This delicious sounding soup has an average of five stars from its reviews. Reviews suggest adding extra curry powder, but we always think it’s best to try a recipe before altering it. The recipe has only 92 calories nine grams of carbs per half cup. That makes it a great soup when you want to feel cozy without getting weighed down. Get the recipe. This creamy soup uses sour cream sparingly to achieve its texture and has very few ingredients. 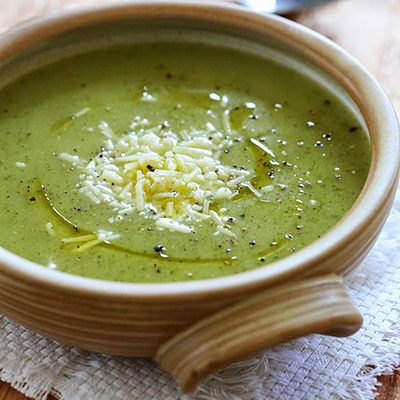 A final drizzle of olive oil and a sprinkle of parmesan can make this gorgeous green soup fancy enough for a dinner party. Even better, half a cup has just over 30 calories and five carbs. Feel free to ladle this into large bowls for a low-calorie dinner or drink it from a mug for a guilt-free snack. Get the recipe. Cream of mushroom soup is a part of America’s fall traditions. Though the creator of the green bean casserole passed away recently, many people will enjoy the recipe on Thanksgiving. While the traditional recipe calls for a can of Campbell’s soup this is would an excellent alternative. 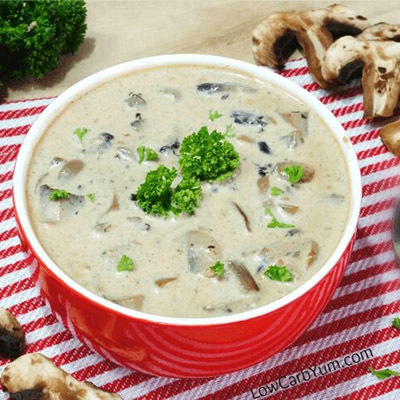 This gluten-free version of the traditional soup uses one and a half cups of mushrooms as well as almond milk and heavy cream. Each serving has 118 calories and under two grams of carbs. Get the recipe. There are a couple of things to take note of before you start cooking. While some of these recipes call for chicken broth, you can substitute vegetable broth in its place if you are vegetarian. You will also see that the carb and calorie counts may be different on the websites than in this article. As the soups had varied serving sizes on their sites, we decided to do the math and convert all the recipes to a half cup serving. You can do your own calculations at home, we simply wanted to offer you uniform information so you could compare your options in an apples to apples way.